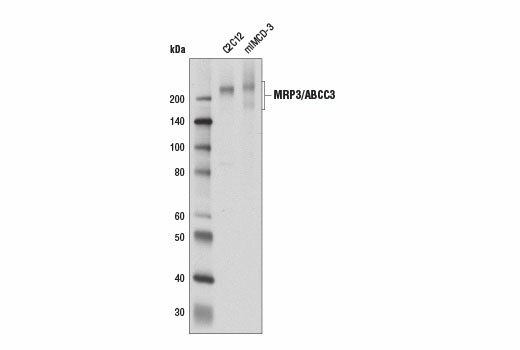 Western blot analysis of extracts from C2C12 and mIMCD-3 cells using MRP3/ABCC3 (D8V8J) Rabbit mAb. Western blot analysis of membrane extracts from human, mouse, and rat liver using MRP3/ABCC3 (D8V8J) Rabbit mAb. Immunoprecipitation of MRP3 from C2C12 cell extracts. Lane 1 is 10% input, lane 2 is Rabbit (DA1E) mAb IgG XP® Isotype Control #3900, and lane 3 is MRP3/ABCC3 (D8V8J) Rabbit mAb. 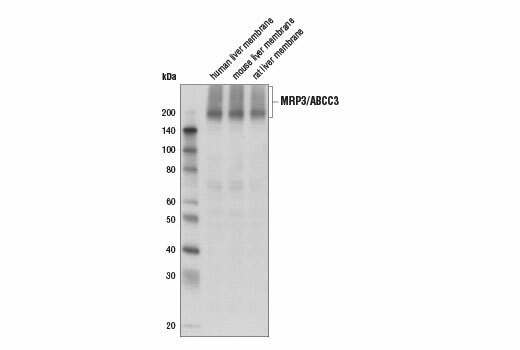 Western blot analysis was performed using MRP3/ABCC3 (D8V8J) Rabbit mAb. 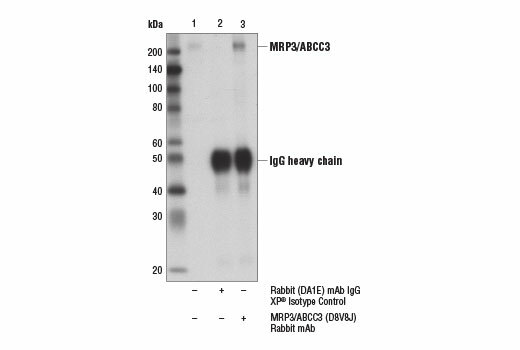 MRP3/ABCC3 (D8V8J) Rabbit mAb recognizes endogenous levels of total MRP3 protein.